Earlier this month, National Green Tribunal ordered Chhattisgarh to submit a comprehensive report on the status of fly ash utilisation in the state by August 10. The principal secretary’s office of Chhattisgarh government has been responsive in preparing this report. An investigation by the Centre for Science and Environment finds disagreement between the public sector utilities—South Eastern Coalfields Ltd (SECL) and National Thermal Power Corporation Ltd (NTPC)—a major roadblock to push fly ash utilisation in Chhattisgarh. A meeting was called on among stakeholders using fly ash and power plants, which includes NTPC, BALCO and other players in the power sector, to come up with a year-wise action plan for fly ash utilisation. Why is fly ash underutilised? Chhattisgarh is a major fly ash-generating state in India because it has a large amount of coal reserves. Moreover, transportation of coal is so costly that plant owners prefer to open pithead coal plants which are profitable. These power plants source their coal from nearby mines saving on transportation costs. The state generates over 20 million tonnes of ash and utilises a meagre 6-8 million tonnes a year. 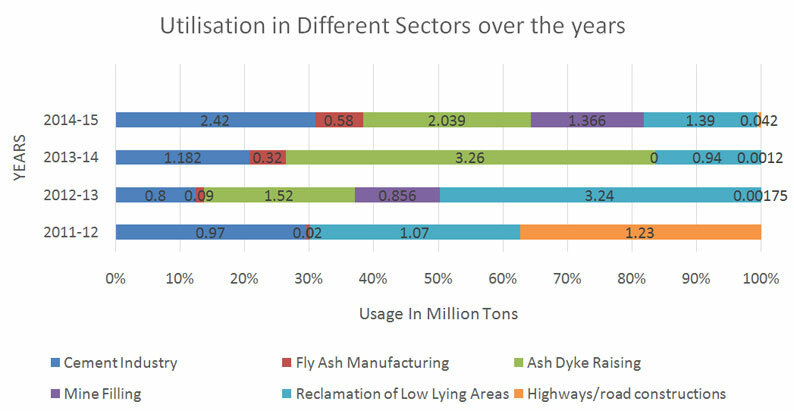 Though it is the third largest fly ash user by quantity, it lags behind in percentage use when compared to Uttar Pradesh, Maharashtra and West Bengal—all generating more than 10 million tonnes of fly ash. A closer analysis suggests that pushing central and state-owned plants in Chhattisgarh to compliance would mean achieving 11 million tonne of utilisation. Just two NTPC plants in the state can lead to utilisation of 9 million tonne out of the 13 million tonnes lying unutilised. However, Chhattisgarh, as on today, has low demand for fly ash for use in construction sector—bricks, cement and roads—which is one of the major fly ash utilisers in other states. This is because Chhattisgarh has a smaller area, consisting mostly of rural settlements, in comparison to other states. With the amount of fly ash lying unutilised in Chhattisgarh CSE analysis indicates 13 billion bricks can be manufactured. However, the entire state needs are only 5 billion. According to RPS Chandel, retired president, All India Brick Manufacturer Association, Chhattisgarh consumes 5 billion bricks a year "about 1000 red brick kilns producing 2,500,000 bricks in a year and another 5000 kilns producing 500,000 bricks are operating in Chhattisgarh". Cement sector utilisation has been increasing over the years: the state has a capacity of producing 14 million tonnes of cement using 2.4 million tonnes of fly ash as raw material. According to CSE analysis, another 1.8 million tonnes fly ash can be taken up by cement industry. Usage of fly ash in roads has drastically reduced. Road sector, as evident from the past experience, can hold another 1.2 million tonnes of fly ash. CSE analysis also indicates that the construction sector in Chhattisgarh has the capacity to accommodate only 8 million tonnes of fly ash with drastic measures in place. “Mine filling can be the only solution. However, SECL is not willing to give coal mines to NTPC and other power stations for mine filling. We are having another meeting to discuss these issues. In a week’s time, we will come up with an action plan,” says Devendra Singh, member secretary, Chhattisgarh State Pollution Control Board. SECL and NTPC declined to comment on the issue after repeated inquiries to various officials. SECL is one of the biggest and most profitable coal producing subsidiaries of Coal India Ltd and has a large base of operations in Chhattisgarh with 52 mines—36 underground and 16 open-cast mines. The NTPC is one of the largest power generators in the state. Interaction with other stakeholders indicates disagreement on the location of mines between the power generators like NTPC and mine owner SECL remains a roadblock that's worsening the issues. "We are filing petitions for the last 13 years, but nothing has materialised," says Laxmi Kant Chouhan, petitioner of the case. In his statement, O P Ojha, executive director (Civil Project), Chhattisgarh State Power Generation Corporation Ltd (CSPGCL) asserts, "NGT should order both the power plants as well as SECL to show how much of fly ash is being utilised." He blames SECL for not utilising open-cast mines, which are feasible and easily accessible, for mine filling operations. “Open-cast mines are not made available,” he says. Citing an example of Korba, Ojha points out that "an open-cast mine near railway station is filled with water, which otherwise may have been used for ash filling purposes. SECL should mandatorily be filing reports on how the allocated land will be used, not only during mining works but even after the operations are complete." Previously, SECL had handed over six mines for mine-filling purpose to NTPC. However, not much progress on utilisation of the mines has happened, according to Ojha. Mine filling is also not a bad alternative given the fact that there have been no major findings of heavy metal seepage from ash ponds. As fights continue and issues amplify, policy makers clear projects not taking into count the cumulative impact on geography and environment. This town, surrounded by hills, is now getting hillocks of fly ash pond around. "Korba is a town with numerous power plants. The entire town is surrounded by mounds of fly ash in all directions and villages are sandwiched between fly ash ponds. 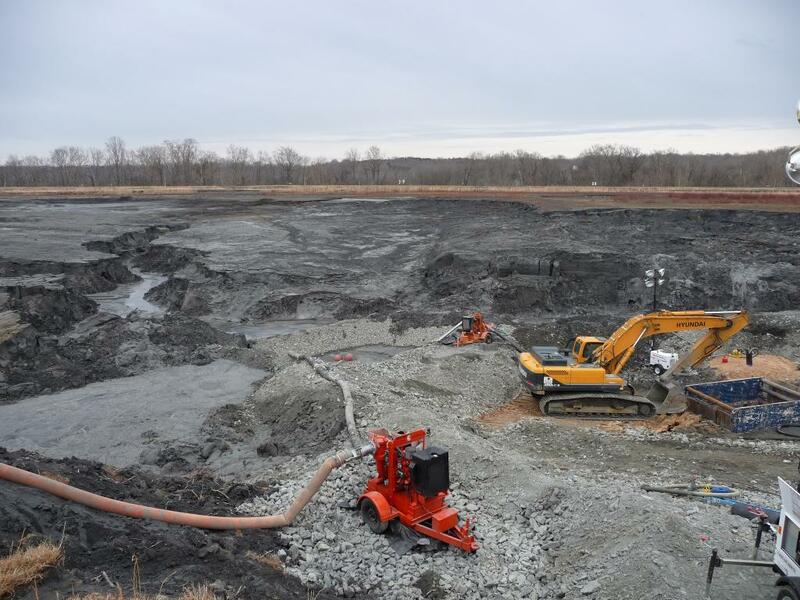 The issue of air pollution from fly ash ponds is severe, especially in summer. The villagers bear with it since no one pay heeds to their voices,"explains Sanjeev Kumar Kanchan, deputy programme manager, Centre for Science and Environment. What initiatives can be be taken to ensure fly ash utilisation? Unless NTPC and other major ash generating power companies sign agreement with at least five cities having more than a million population to supply 2.5 million bricks through rail in a day, or a solution is met between SECL and NTPC, the problem may continue. “Fly ash bricks can be profitable to power station,” according to Vivek Taneja, head of Power Division, Thermax. Production cost of bricks in power station as per Thermax estimates is Rs 2/brick and transportation cost through rails should add another Rs 1.8/brick up to 1200 km, according to CSE estimates. Noticeably, NTPC, Sipat has already installed a fly ash brick manufacturing unit with a production capacity of 80,000 bricks per day. As the plant is situated far away from mines, inclusion of brick plant is a step in the right direction. But S Bhattacharya of NTPC, Sipat says, “Brick production has never reached its optimal capacity due to low demand.” It is high time policy makers ensured that waste generators take special efforts to create demand or adjust to the solutions offered. A 100 per cent ash utilisation in Chhattisgarh can push an overall 10 percent ash use in India from 55 to 65 percent as on date.